As one season ends another opens and, as the Oscar Wilde season slowly fizzles out at the Vaudeville, attention turns to the short plays of Harold Pinter all of which will be staged by the Jamie Lloyd Theatre Company to commemorate a decade since the influential playwright’s death. In the next 6-months every single one act Pinter play will be presented together for the first time across seven specially curated ‘collections,’ and hosted at the theatre posthumously named after him. With 20 plays to look forward to and a host of star names already attached to the project as both actors and directors, the seasons builds to a much-anticipated stage appearance by Danny Dyer and Martin Freeman in February. First though, Pinter One will run for just 23 performances, tackling four plays and a sketch in two hours and 15 minutes – The New World Order, Mountain Language, The Pres and the Officer, One for the Road and Ashes to Ashes. With any season, it’s vital that the first production sets-out the Company’s intentions, taking a perspective on the work that will guide the audience through the run and, ideally, generate repeat-business for the subsequent shows. By emphasising the common themes in Pinter One and the topicality of their subject matter, this a very strong start for the Pinter at the Pinter season. As a director Lloyd has a particular skill in drawing out the dark absurdity of the plays he selects, finding the point where the comic surface meets the sinister underbelly, and from this Lloyd often finds an uneasy or threatening tone where characters seem unable to escape the confines of their limited existence. 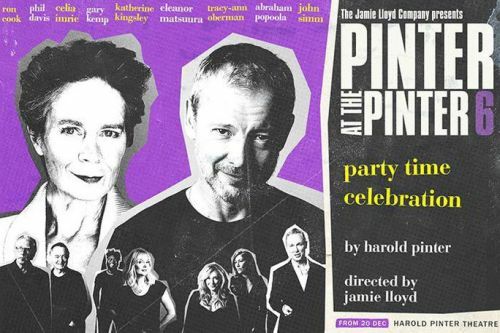 While his work tends to polarise audiences, Lloyd has a special affinity with Pinter helping to make the work more accessible than it can sometimes be, resulting in a particularly fine version of The Homecoming a couple of years ago. It’s ok to admit that Pinter is hard and often very weird, which to audiences used to straightforward narrative plays with a discernible beginning, middle and end, means watching Pinter can be a disconcerting and difficult experience. And he’s not a writer that you can just walk into a theatre and make sense of straight away, it takes practice, you need to time to get used to his style, to disconnect from the safer dramatic conventions we are familiar with and, like the theatre of the absurd (which is closely related to Pinter’s style) to refocus on the play’s themes and tone rather than character and plot. Pinter is all about tone. Lloyd directs the entire first half of Pinter One which contains three of the plays along with some other monologues and sketches, but don’t expect to know exactly where one piece ends and another begins. Set in a dystopian world, these works focus on Pinter’s political commentary in which a series of scenes shows the audience different aspects of an oppressive regime where free speech, individuality and dissent are violently crushed. Set in a series of metallic grey rooms housed in a revolving cube that carves the stage into a variety of angular shapes, Lloyd and regular design collaborator Soutra Gilmour have created a singular setting that unifies The New World Order, Mountain Language, The Pres and the Officer and One for the Road in one terrifyingly bleak series of prison cells and interrogation rooms. This proximity to everyday experience feeds through the show so, like all good science fiction, Pinter slimly disguises fears about heavy government regulation, attacks on outsiders and the ease with which the thin veil of society can disintegrate. With New World Order we see a naked man blindfolded and tied to a chair about to undergo some kind of torture, but first his respectable looking, even effete, attackers (O’Neill and Papa Essideu) goad him with what they’re about to do to him. It’s a wonderfully sinister piece about the anticipation of violence that becomes almost as frightening as the act itself which we never see. 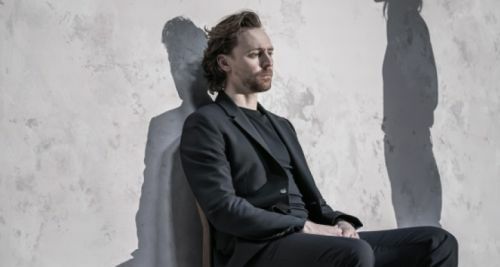 Both actors exude the kind of quiet menace that is so particular in Pinter, rarely needing to raise their voices, the surface and the reality being not what they seem. Mountain Language begins seamlessly as two women (Kate O’Flynn and Maggie Steed) are questioned by camp guards, told their regional language is no longer permitted. Both are looking for their abducted husbands and eventually discover the brutal truth of what happened to them. Here identity and communication are the focus, where a regime can destroy a distinct group by erasing or forbidding its language – not so different from the themes of Brian Friel’s Translations and pertinent to our multicultural society. This rapidly turns into the recently rediscovered sketch The Pres and the Officer in which a foolish American President orders the destruction of the wrong place. It’s the only duff moment of the night, less for Pinter’s writing and more for the all too obvious Trump allusion, performed by Jon Culshaw. The rest of evening creates such a subtly hostile tone that the buffoonery of this section feels misjudged. Just before the interval the final piece of Lloyd’s sinister world is revealed and, as with the preceding works it looks very different below the surface. As the lights go up, the gently-spoken Nicolas (Anthony Sher) is questioning a frightened companion (Essideu) in what looks like a therapy session, but very quickly becomes much odder as Nicolas demands to know if Victor likes him. The former does most of the talking, posing questions and emphasising the power he has to do whatever he likes while believing that God speaks through him. As Nicolas goes on to separately interrogate Victor’s wife Gila (O’Flynn) and son Nicky a ritual of violence and sexual assault beyond the walls of the room emerge, which Nicolas enjoys in the abstract. Sher is wonderful as the intimidating but strangely needy interlocutor who seems to revel in the repeated acts of terror the family have endured, as though organising the pain from afar. Sher draws out the ambiguity in Nicolas’s need for this human interaction but is callous in his dismissal of their suffering, a powerful statement again about the smiling villains that seem to unite these shows. Essideu is the image of wide-eyed terror as he crumples under Sher’s menacing glare, while O’Flynn is a powerful presence as the repeatedly violated Gila. At the interval the actors take an unusual bow and most won’t return for the final play Ashes to Ashes directed by Lia Williams. Visually and stylistically this initially seems very different to the work earlier in the evening, set in a more modern flat as two lovers return from a night out and fall into conversation about the past. But Williams easily demonstrates how well Pinter’s play fits with the earlier shows, as conversation gives way to interrogation and intimidation with fragments of intruding memory that the audience must slowly piece together, linking a traumatic event with the totalitarian state presented by Lloyd. Essideu as Devlin takes on the role of the increasingly sinister man whose motives are distinctly hazy, whether he’s acting out of jealousy or fear of discovery is left entirely open, but an early throwaway line about hypnotism feels crucial as the play concludes. O’Flynn is the troubled Rebecca torn between declaring her love for Devlin and the two memories that continually interrupt her thoughts. What we see across the works in Pinter One is an examination of power and how rapidly it can be corrupted. 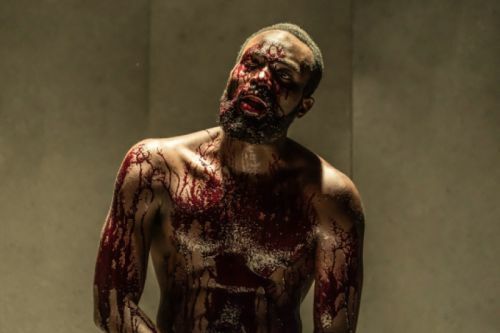 The selection of plays reiterates modern fears that division, isolation and prejudice quickly descend into the brutality of Orwellian military states, where an innate love of violence is too easily awoken. This is a very political anthology of work that collectively asks big questions about the stability of current society, the intelligence and charm of our politicians and our openness to difference and diversity. Pinter’s work here is a warning against complacency, to accept that we’re always on a knife-edge where good people can want to do hideous things with the smallest inducement. Theatrically, Lloyd’s opener, co-directed by Williams, sets-out a clear thematic vision for the season ahead, with common plays presented together to offer insight into Pinter’s political and dramatic purpose. It’s also a trademark Lloyd production, innovatively staged and quirky, and although the pop culture references are more restrained than usual, snatches of Jerusalem and Zadok the Priest suggest the exploration of British identity may play a significant role across the season. Pinter is difficult, but a one-act season is a good way to get a taste for his style, and in Lloyd’s hands it’s a compelling start. 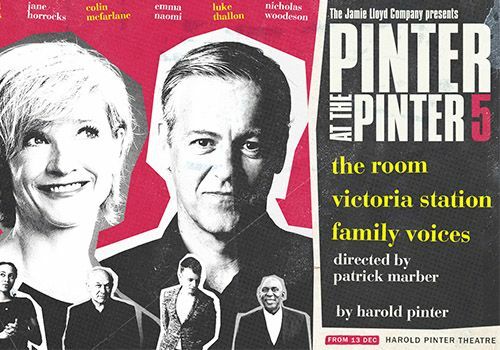 Pinter One runs in repertory until 20 October and tickets start at £15. Follow this blog on Twitter @culturalcap1 or Facebook: Cultural Capital Theatre Blog.